HF: Tymon Mellor has sent this extract from a longer Pathe film from 1953. It shows the lower end of a quarry adjacent to a road. Here a group of about twenty men and women are undergoing the final ardous process of breaking stones into aggregrate sized pieces using a variety of tools. Can someone identify exactly where the quarry and workers were 61 years ago? Thomas Ngan thinks he may be able to. 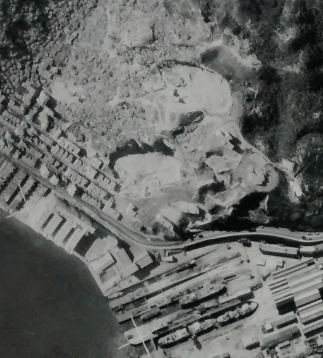 This cropped aerial photograph (1) from 1964 shows Taikoo Dockyard at the bottom. And in the centre what appears to be a quarry with housing very similar to that which appears at the start of the film. This shows the present day area between Quarry Bay and Sai Wan Ho, along one of the back streets. At the end of Tai Foo Street can be seen what looks very much like a disused quarry. HF: I have seen this kind of stone breaking being done in various places but not in Hong Kong. Most notably in India on a bridge crossing a river in 1988. Huge river boulders were being very slowly broken up with chisels, wedges and sledge hammers.These large stones were themselves being broken up. And so on by about six different groups each responsible for reducing the size of the stone. The final stage was up on the bridge itself where a group of women and children were doing what you see in this film extract – creating gravel-sized stones. These were thrown directly on to the road and covered in tar. Tymon has also provided a some background information to ‘permit’ quarries which the one in the film may well have been. The index shows several articles about quarrying in Hong Kong. Today an Ambulance Depot, a school and part of a Police Station of sort appeared to be sitting on the quarry site. The Police Station seem to be in the 1964 photo too.